It was lovely yesterday evening to celebrate all things earthy and green for Green Sod Ireland’s Earth day walk. 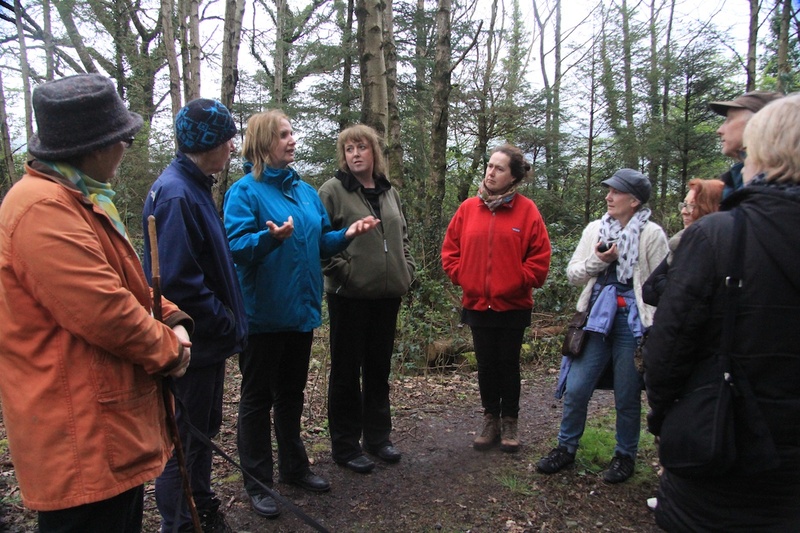 It was a soft grey evening and Mary White of Blackstairs Eco trails led the walk down the lanes right next to Hollywood. Mary gave us information on the history of the lane and many of the plants along the way. Something I didn’t know was as the upper reaches of the lanes have never been sealed, the plants there are chemical free and great for food foraging! It is my favourite time of year too, all that spring bright green growth and flowers everywhere, although I find all the seasons have their own beauty and interest too. right in Hollywood – I’ve been to many open forest days but this was the first time I have led a forest talk myself. Thanks to all who came and the great comments and chat too! Click on an Hollywood sign image below to start the slideshow. Many thanks to all at Green Sod Ireland and Mary White of BlackstairsEcoTrails.ie. Donations to help save our ‘wild-acres’ can still be made to Green Sod through their website too. As always, comments welcome and enjoy the South Carlow Hollywood Earth day walk below! Wonderful beech trees line the upper part of the lane and the fun of dog and human group photos. actually the methodology chapter has helped my work so much, or the articulation of it… still miles to do but yours sound like a great connection. Thanks for the opportunity Victoria and drop in anytime! Great to have the photos and your post to remember this inspiring event. Your talk illustrated with the wonderful Ipad images..and the surrounds of Holly Wood was excellent ! Thanks to you and Mary. I completely forgot to tell you I posted the above images and some more on my Flickr here https://www.flickr.com/photos/cathyfitzgerald/sets/72157644282808473/, you should be able to download any you need and thanks for crediting them too. So great to have the opportunity to do a Hollywood talk too, thank you.